The last week of winter saw record-breaking temperatures soar into the 80s. What little snow was on the ground was quickly melting away. Ice fisherman raced to the many lakes and ponds in our area to take their ice shacks off the pond before they’d sink into the depths. It had been such a warm winter that there were only about 4 or 5 days when snowmobiling was possible; usually the season lasts 2 or 3 months. 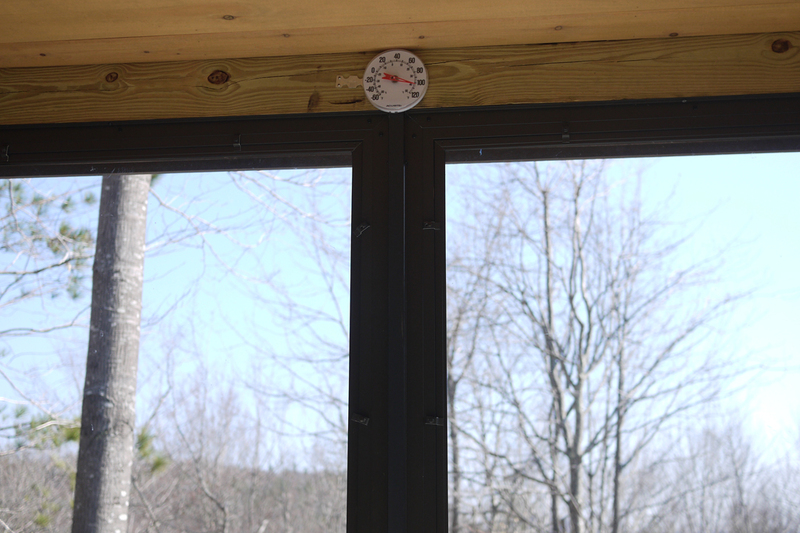 We put clear plastic panels on our screen porch in the Fall, and through passive solar, the interior is heated nicely, usually to 40 – 60 degrees on a sunny winter day, even when temperatures outside are well below freezing. 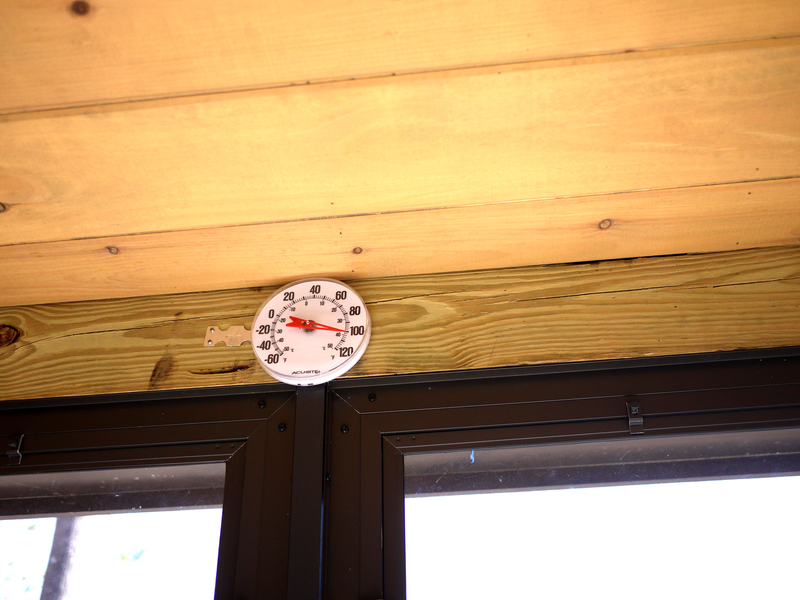 But the week of unprecedented warmth made the inside temperatures of the porch soar to over 100 degrees! Our porch, with plastic panels inserted. Due to passive solar, the interior is warmed on a sunny winter day making it usable most of the year. . .
Due to a lack of rain and so little snow, there wasn’t even much of a mud season this year. What a perfect day for a hike! 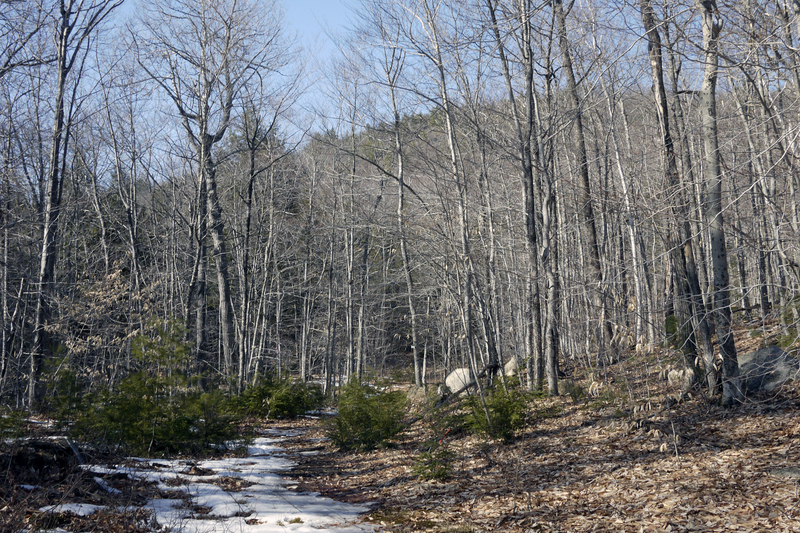 We decided to explore some of the trails maintained by the Greater Lovell Land Trust. 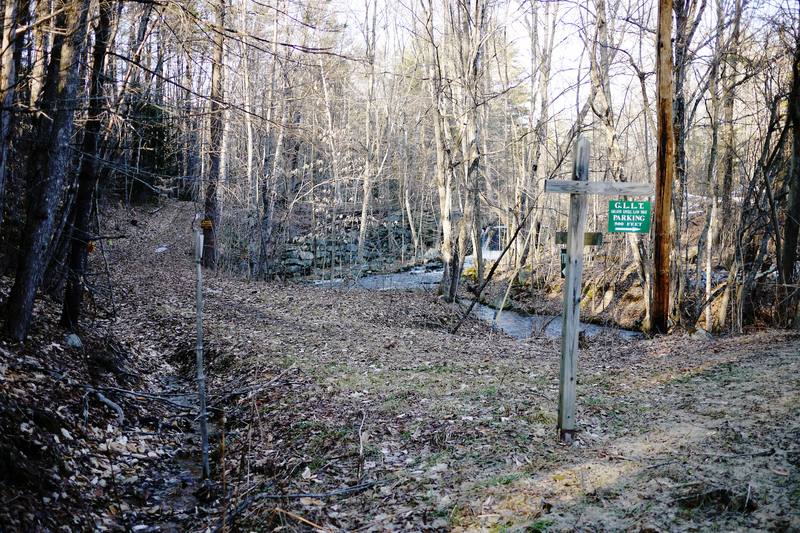 This non-profit conservation group buys up large tracts of land in our area to prevent subdivision and development, in order to keep the woods in its pristine state. Author and local summer resident Stephen King is one of its major supporters. They do allow public access to this land via a network of trails they’ve created so people can enjoy the many quiet and beautiful sights in the woods, via hiking, bird-and animal-watching, etc. In addition to their trail maintenance and newsletter, they also offer guided hikes and nature talks. Everything is done by volunteers. We were dog-sitting for 10 days for some friends of ours from Portland ME. 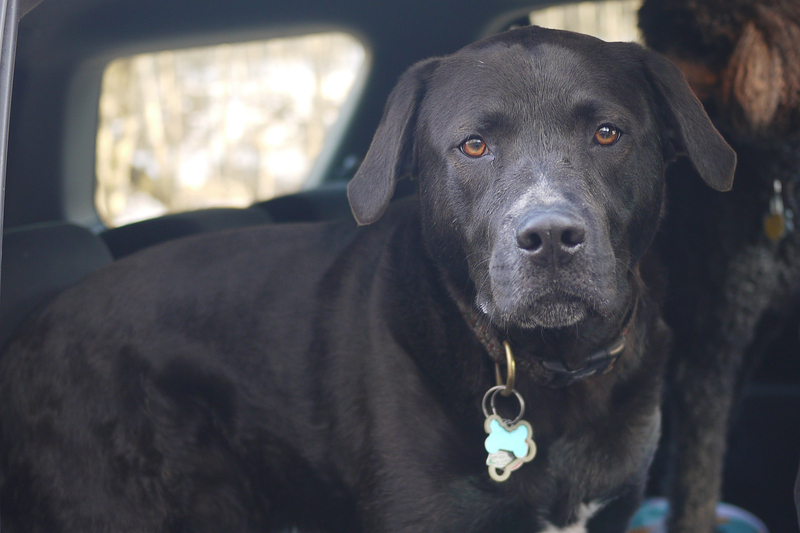 Fortunately their dog, Feivel, a lab mix adopted from a shelter, got along great with our dog Spencer, so we took them both on our walk in the woods. 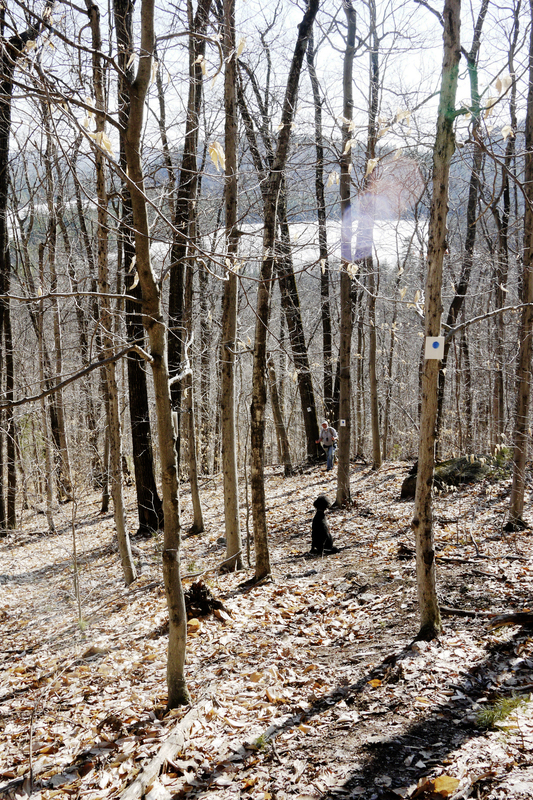 Our first walk took us to the base of Amos Mountain, along Kezar Ridge Rd on the border of the towns of Waterford-Stoneham. Since the day was so clear, there was promise of great views of the surrounding and distant mountains from the top. In fact, we saw all the way to Mount Washington in New Hampshire, the northeast’s tallest mountain (which is most often immersed in clouds). One of the first things we noticed is that there was really no “cut” trail. But the trail markers were outstanding, the best we’ve seen, and it was impossible to get lost with the frequent blue blazes and arrows pointing the way to the top. 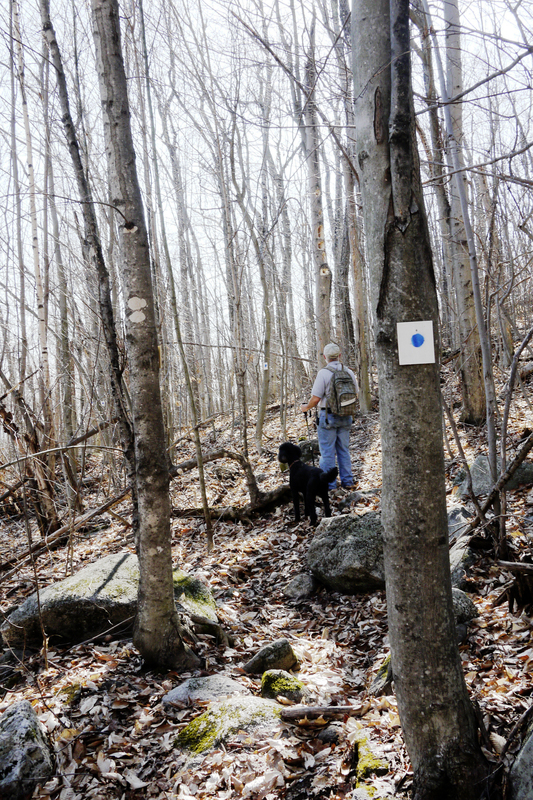 Since our area is one of the least-traveled areas of the White Mountains, in many cases trail markers are few and far between and poorly maintained, either due to lack of volunteers or funding from the Forest Service. 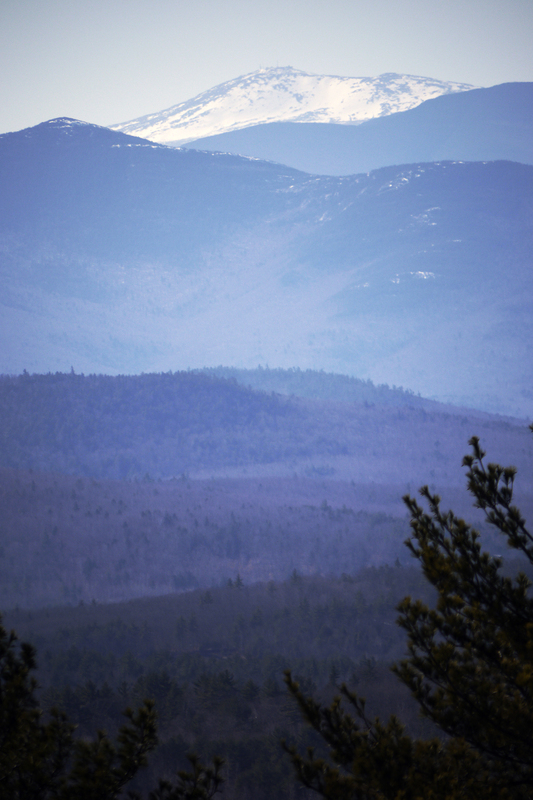 We’ve gotten lost more times than I care to count due to poorly marked trails in the White Mountains. So it was a real pleasure to see that the GLLT takes trail maintenance very seriously. 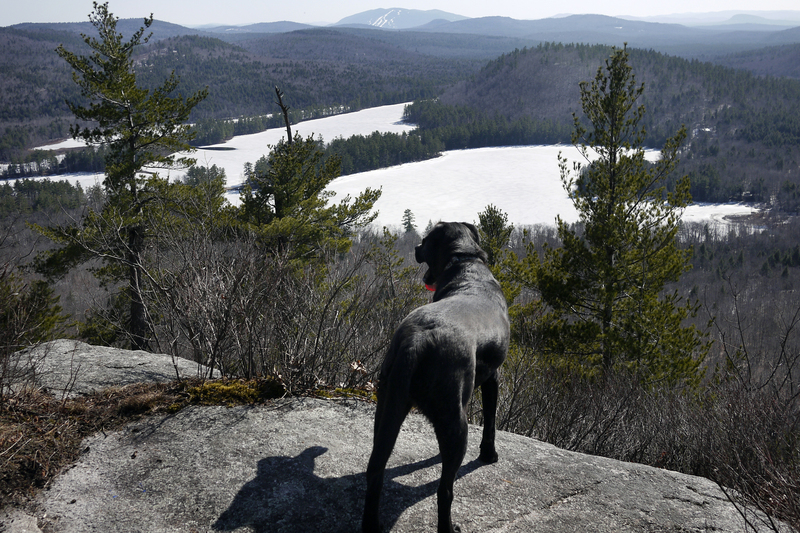 Midway up the mountain, Spencer gazes at the view below of the still-frozen Kezar Ponds. 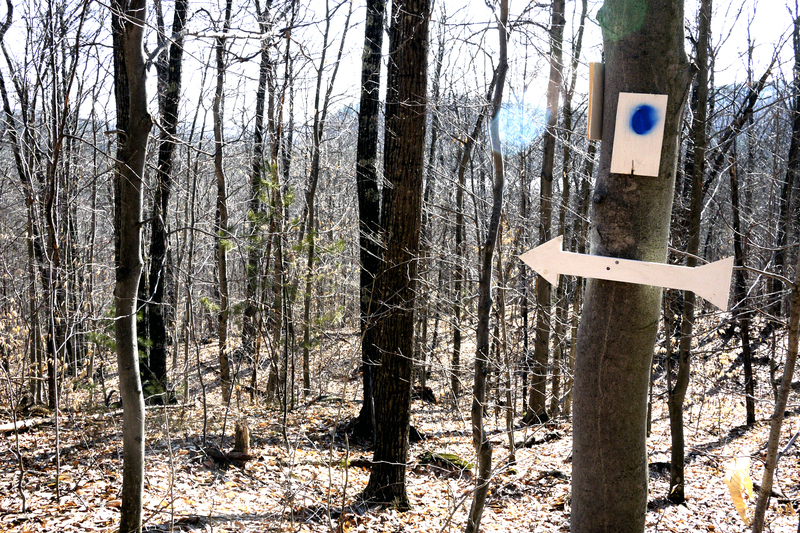 The blue blaze trail marker is on the tree to the right. The view at the top was worth the effort. 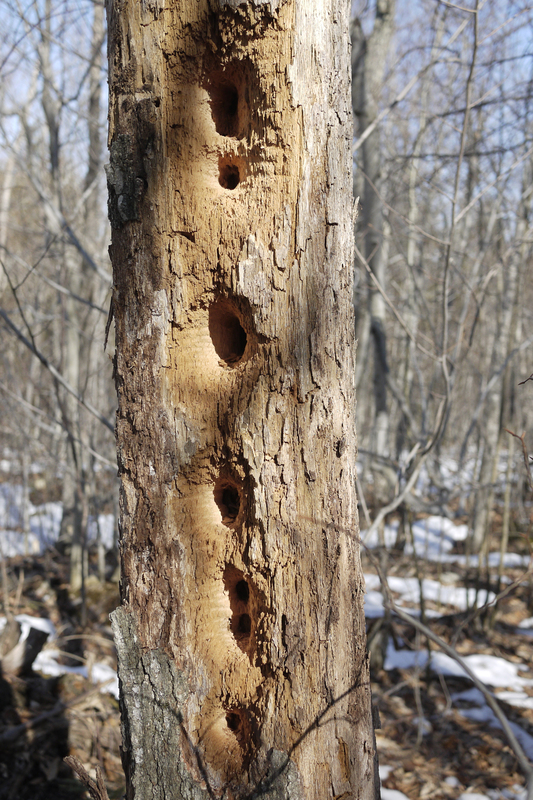 Woodpeckers really went to work on this tree! After we completed this hike, we still had a few hours of daylight left. So we went to another GLLT trailhead by Slab City Road that walks alongside Heald Pond. 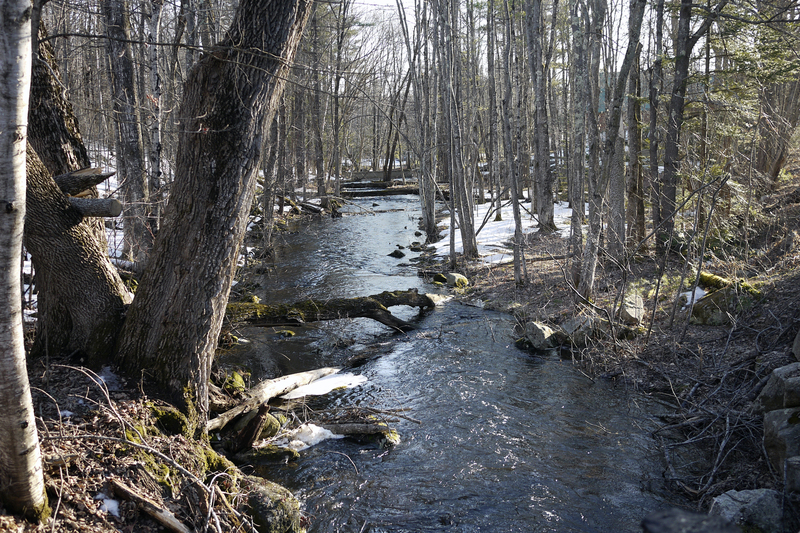 The stream was flowing fast and hard due to snowmelt. By now we were sore and tired so we called it a day. There is a saying, “a happy dog is a tired dog,” but really it should read, “a tired dog is a happy owner.” We loaded the dogs in the car and we all slept soundly that night! Moose visit the boggy pond at the bottom of our driveway every Spring, but this year due to Pesach, we were pretty sure we’d miss them. We returned to our home town a couple of days ago so I’d have adequate time to prepare for the holiday, and by the time we return to Maine they will likely have moved elsewhere. 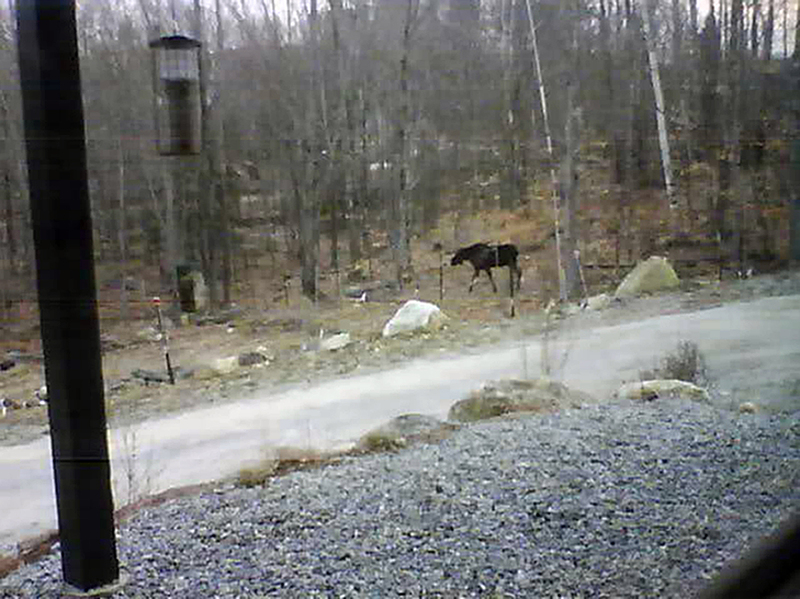 At the last minute before we left I had the idea to put a webcam that is motion-detection sensitive by the window, thinking that at least we’d see birds by the birdfeeder. There are dozens of types of birds that inhabit our woods, especially during the warmer months, and we welcome their return in the Spring. (During the winter it’s mostly blue jays, chickadees, woodpeckers, owls, and the occasional cardinal). Indeed, in the days before we left, the woods were downright noisy with calls from foxes and coyotes, and many types of birds, ducks and geese. One of the Chabad bochurim (young men) who came up to Maine for Purim told us a little about himself, and I think I finally may have an answer as to what yichus is truly about. “Y” is one of 14 children; his father is the rabbinical leader of the Russian Jewish community in Toronto. This young man is terribly proud of his family; not with a sense of superiority, but rather, with nachas. He took genuine joy in his family’s accomplishments, and the love and closeness he felt towards them radiated outwards. All of the children in his family were raised with a mission to serve and reach out to the Jewish community at large, and feel genuinely that this is their purpose in life and approach it with great enthusiasm. They are a very old Chabad family – generations and generations of affiliation with Chabad. The young man’s father, grandfather and great-grandfather, born and raised in Russia, were not only affiliated with Chabad, they were rabbis under the most difficult and dangerous times, during the Bolshevik Revolution, pograms, the two World Wars, and Stalin. Out of necessity, they performed mitzvos in secret and educated their children in all things Jewish, despite the possibility of imprisonment, hard labor or death should they be caught, during a time when neighbors and “friends” were spies and even children informed upon their own parents if they didn’t conform to communist ideology. They wished to name their infant son after the previous Lubavitch rebbe (Yosef Yitzchok Shneerson), but knew that to do so would be courting further danger. So when it came time to declare the baby’s name at the bris, the boy’s paternal grandfather cried out, “Yosef! After my father, may he rest in peace!” But no sooner had he spoken, when the boy’s maternal grandfather cried out, “No! It must be Yitzchok, after my father, may he rest in peace!” To the horror of the guests, an argument and shouting match ensued: “Yosef!” “Yitzchok!” “Yosef!” “Yitzchok!” and the two grandfathers nearly came to blows at their grandson’s bris! The visibly distressed father of the baby decided to make peace: “We will call him Yosef Yitzchak” and so it was. Of course the entire “altercation” had been a ruse and distraction, but now the government was satisfied the child was being named after both his deceased great-grandfathers rather than the Lubavitch Rebbe, and they were mollified. Yosef Yitzchok’s parents were determined that he would be given a proper Jewish education and observe all the mitzvos. They also did not want him to be corrupted by the government school, whose Communist ideologies succeeded in brainwashing the littlest “comrades” and encouraged them to not only reject their parents’ religion, but to inform upon them if they dared practice it. But every child from the age of 6 or 7 was required by law to attend the local government school. So Yosef Yitzchok’s parents came up with a plan: they would send their son away to the town where his grandparents lived, and he could attend school there. That’s what they said they were doing. Instead, they kept their son hidden from the age of 6 in their home, completely out of the public eye. Yosef Yitzchok had to remain completely indoors all of his young life. The only time he was able to venture outside was in the summer, when there was no school and he “returned home” for a “visit” during school’s hiatus. One day little Yosef Yitzchok must have been frustrated by the extreme confinement, because he wandered carelessly outside. Suddenly he heard his neighbors approaching! He quickly dashed into his family’s outhouse in the backyard (they did not have indoor plumbing), where he was forced to remain for many many hours until the neighbors finally went back indoors. He never made the mistake of venturing outside again. And so he was raised a completely frum Jew, well versed in Torah and mitzvos, right under the nose of Stalin and the Communists! When a child is raised in a home where mitzvos are performed with joy, and he hears of the sacrifices and mesirus nefesh that his father and grandparents experienced in order to remain observant Jews, he has a sense of legacy. He truly feels his importance as a link in a long chain of generations of Jews, and he feels the responsibility and privilege of continuing along the same path to ensure the link remains unbroken in the future. I don’t know anything about my own great-grandparents. Our grandparents’ generation wished to break free from the anti-Semitism and oppression they knew in the Old Country and so when they came to the “Goldeneh Medina” – the US – they threw away any remnants of Jewish observance. They Americanized their names. And sadly, they were embarrassed by the old-fashioned ways of their forefathers so they ended any ties to their past. Their children and grandchildren grew up without a sense of legacy. It’s much easier to reject Judaism if one doesn’t feel that one is a link in a chain that has profound historical, religious and personal significance. Devoid of legacy, the individual bears little sense of responsibility or appreciation for continuity. I still take issue with the modern-day shadchanim who emphasize yichus. Because the yichus that they’re talking about means little to me: name-dropping about ancestors with no emphasis on the character of the prospective person of the present. But genuine yichus? That’s the sense of legacy, of knowing who your ancestors were, knowing the extent of their commitment to living a Torah-filled life and passing on the beauty of their faith and love of G-d despite all odds against their doing so, and imbuing their children with a sense of pride and strength, belief, faith and desire to continue that link in their children’s children and grandchildren and future generations until the Final Redemption. That was that young man’s heritage: he had genuine yichus. As a ba’alas tshuva, that is something lost to me. I can only hope to transmit it anew to my own children and grandchildren, so that they will someday have their own claim to yichus, as it’s meant to be. The two Chabad guys who drove 7 hours from Brooklyn to read the megilla in rural Maine spent the night at our house, and planned to set out on their return trip to New York at 5:30 a.m. the next day, so they could make it in plenty of time for Shabbos. We said our (early a.m.!) goodbyes and went back inside the house, where I hoped to go back to sleep for an hour or two. But about 2 minutes later my dog started barking, so I got out of bed to let him out and was met with quite a surprise. 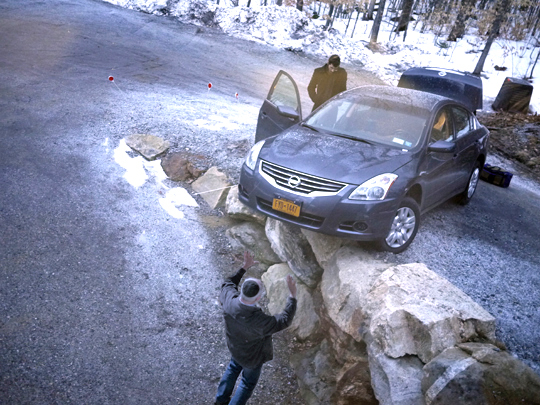 Somehow the Chabadniks had “missed” the driveway and their rental car was now dangling precariously off the retaining wall, seemingly about to plunge about 8′ straight down. The car was sitting on 3 wheels, with the fourth floating in midair. We weren’t quite sure what to do! The car couldn’t be pushed or easily extracted, and we ran the risk of it plunging down the abyss. The boys took out the tire jack and propped up the car, my husband laid some wood planks down for traction, and miraculously, and I do mean miraculously, the car was able to back out of the mess and continue on its way. I don’t know if they felt better or worse knowing that they were completely sober when this occurred. Perhaps G-d took note of their mesirus nefesh [going the distance, (literally!) to perform a mitzvah] in coming to Maine to read the megillah, even if it was just for a handful of people. 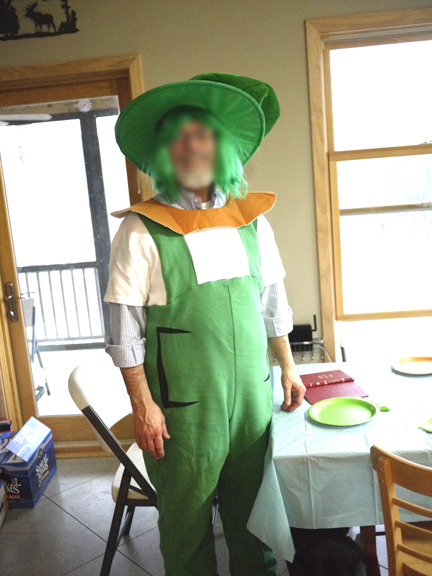 Unfortunately, Purim was a dud. At least I did my hishtadlus (put forth maximum effort). I put an ad in the local paper. 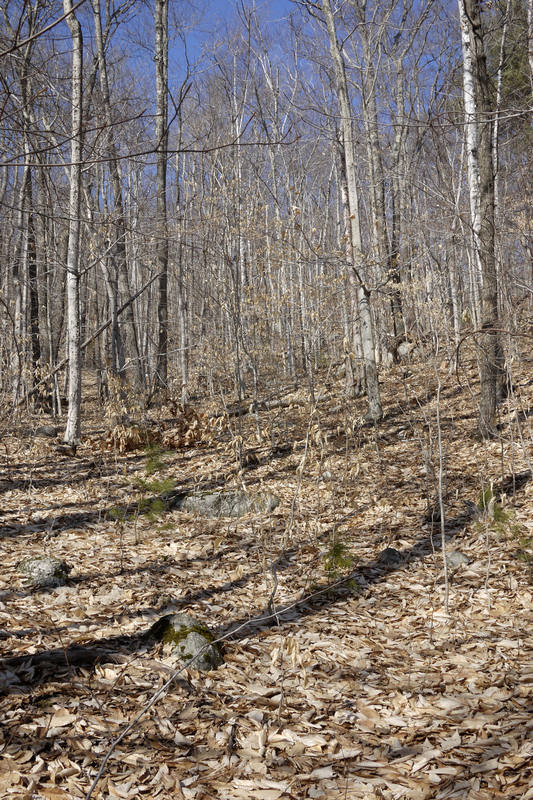 I sent out lots of email and phone invitations to Jews in the woods of Maine; I had a fellow who runs a Jewish chavurah in New Hampshire send out email invitations to the families on his roster. I did manage to get a response from about 7 families – – all saying they couldn’t make it, that a weekday celebration was too complicated, that they wouldn’t get back in time from work to hear the megilla reading at 4:30 pm. Still, I forged ahead, despite the ominous signs, operating on the premise of “build it and they will come,” which has always worked well for me in the past. I figured people who couldn’t make it in time for the megilla reading might still show up for the dinner seuda. It’s called bitachon – faith. I guess I was in denial. Because this time it just didn’t work – we built it and they didn’t come. Two young men from Chabad yeshiva in Brooklyn shlepped in a rented car 7 hours to be with us and read the megilla. This was quite a sacrifice for them, as Purim is really one of the brightest highlights of their year, when they celebrate joyously (and drunkenly) with their friends and teachers. Besides the Lubavitchers and ourselves, only 3 people came. I cooked for 20. Just in case. That’s not to say it wasn’t nice – it was. There was interesting discussion and divrei Torah and plenty of l’chaims. 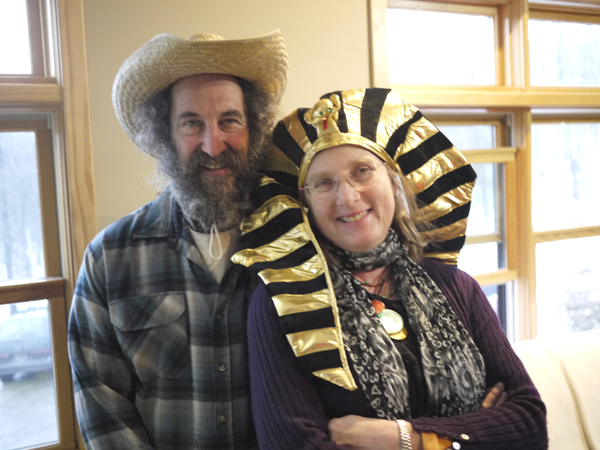 And most important, it provided a Purim celebration for three people who would not have celebrated otherwise. But it was hard not to be disappointed. I really put my heart and soul into this. I cooked and baked every day for a week beforehand. Who knew Purim could be as expensive as Pesach? We spent tons of money – and I do mean TONS – on this celebration, between the ad in the paper, the food, the paper goods, the costumes, and the major expense of paying for the gas, rental car, and services for the two yeshiva students. I missed my home town celebration, and the nachas of my grandchildren’s excitement being in costume. It was an experiment, and I knew the risks, but somehow I didn’t expect it to fail. So I guess next year we’ll do Purim in our home town. Hey! Next year Purim falls on Sunday! Maybe more people will come since it’s on a weekend? In preparation for upcoming Purim festivities, I made my own schnapps this year (it’s hard to find liqueur with kosher certification in Maine). I bought Everclear Grain Alcohol (190 proof! ), made a simple syrup (1 part sugar to 1 part water, boiled until all sugar is dissolved), and made two different flavors: coffee mocha (I used very strong fresh-brewed Starbucks coffee and pareve chocolate), and limoncello (an apertif served in Italy; I used Meyer lemons). Both came out great – they’re potent, smooth and delicious after fermenting for a couple of weeks. But now a new dilemma: nothing to serve them in! I bought souvenir glass shot glasses with a moose design on them, but then I realized I had no way to toivel the glasses (immerse them in a mikva before their first use). Usually I use one of the many natural lakes and ponds in my area to immerse new dishes, silverware, etc., but currently all nearby bodies of water are frozen solid with many inches of ice, and I lack the special augers used by ice fisherman to cut an opening in the ice to access the water. 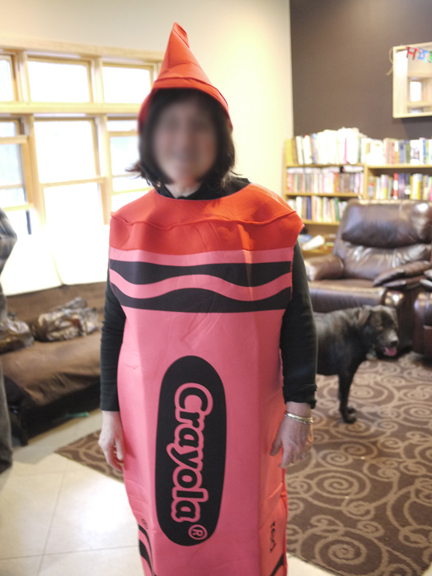 I can’t believe I forgot my box of Purim costumes when I traveled from my home town back to Maine! Now that post-Halloween clearance sales are a thing of the past, the costumes from Walmart are long gone, and the closest Party City is about 1 1/2 hours away. Although there are thrift shops about an hour away, there’s rarely anything crazy enough to use as a costume: the standard Maine mode of dress is jeans, turtlenecks and flannel shirts and that’s about as exciting as it gets, used or new. 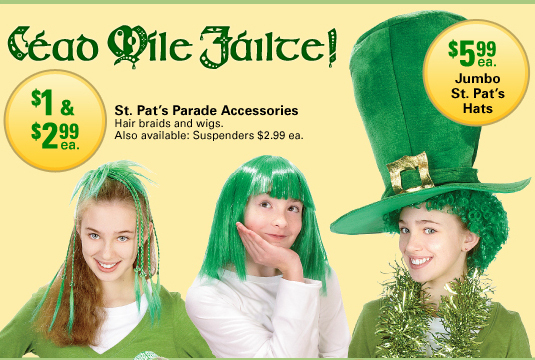 I truly hope I don't have to resort to dressing up as a leprechaun, but when you're desperate, rational thinking goes out the window.